Over this weekend, I made the trip up to Washington, D.C. to attend the 2009 Pollies Conference. One of the breakout sessions from the conference was focused on leveraging mobile technology in politics and how it has already been used successfully. The panel for the session was Kevin Bertram, CEO of Distributive Networks; Scott Goodstein, the brain behind Obama's text strategy; and Christan Zimmer, CEO of the Mobile Giving Foundation. 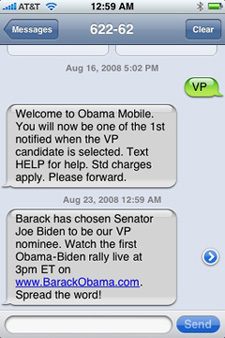 Everyone was exposed to the success of Obama's mobile strategy through his VP announcement via text. While that instance is most likely the Mobile "posterboy" example of 2008, there are still many other things to take note of relating to the importance of mobile. Predictably, there is great penetration in the young voter demographic with 76% of 18-24 year olds texting regularly. What's more surprising is that the medium's dominance even extends to senior citizens, with 19% of the 65+ age bracket texting. Mobile is no longer restricted to teenagers and twenty-somethings. The statistics demonstrate that mobile is now a mass medium with deep penetration in every demographic. Furthermore, Kevin Bertram relayed a very compelling statistic that all of Distributive's internal and external studies had consistently demonstrated approximately a 4% increase in voter turnout when mobile is used in the days leading up to and on election day. That is a shocking number that shows the power of texting and how it can be used to engage and excite a campaign's base. A 4% bump it turnout can easily be the difference between winning and losing come election day. The medium is absolutely exploding with activity and continuing to grow. Zimmer stated that on the first day that texting was available in the US in 2001, there were approximately 20,000 messages sent over the network that day. Today, just eight years later, literally billions of messages are being sent over cell phone networks every day. Text messages have an extremely high read rate due to the captive nature of the audience and the strict control of SPAM messages managed by the US carriers. Voters are checking their email less and less and are more prone to delete campaign or superfluous emails. However, texts still have an abnormally high read rate as people are constantly checking their phones and read nearly every message before deleting them. There's clearly a huge opportunity in leveraging mobile technology in political campaigns. From engaging hard to reach demographics to delivering definitive results on election day, the medium has already proven itself to be valuable to campaigns of all sizes. Give Incentives. Everyone loves free things, and voters are much more willing to part with their data in exchange for something tangible. Some great examples of incentives utilized by the Obama campaign and others are bumper stickers, ring tones, and cell phone wall papers. Tell supporters that by texting a short code to the campaign that they will receive one of these incentives in exchange. On-site/event participation. At a fundraiser or rally, have a specific part of the event dedicated to having people subscribe to your text list by having a moment for them to text in the shortcode to subscribe. Obama utilized this strategy at nearly all of his rallies. One thing the panelists made sure to note was that you give the attendees a few minutes warning before they need to make the actual text; for example, ask them to pull out their phones a couple minutes before displaying the actual short code. Sweepstakes and Contests. Manage a contest where participation is strictly managed through supporters texting the campaign. Examples of possible prizes are the opportunity to meet the candidate or have a VIP ticket to an expensive event. Promote the contest on the campaign website, at events, and through other media for supporters to text a specific short code to be entered into the contest. A "Must Have" Offer. Distribute exciting and compelling information and offers solely through texts. For example, tell supporters that the location of the post-rally party will be offered exclusively via text. Or guarantee that once a month via text, the campaign will send out information about the candidate's whereabouts for supporters to meet him/her. People will be likely to give up their number for texting if there is an exclusive offer tied to the medium. All of these methods have been successfully utilized by political campaigns, non-profits, and corporations to help build their lists. These strategies are very inexpensive to the campaign and can be used in conjunction with each other to quickly build out a large, excited, and engaged list. Even though the panel was stacked with mobile evangelists who had successfully leveraged the technology, they were still adamant that texting is only the right strategy in certain cases. Texting is a great strategy to be used for communicating with your core base. These supporters have already bought into your campaign's message and will be excited to receive an intimate message to their handset. You don't need to convince them of the merits of your campaign, but can simply use texting as another way to engage them and get them more involved. The panelists admitted that texting is not going to replace the other current major forms of political communication such as direct mail, TV, or even email blasts. The fact is that texting is not an effective persuasion tool. With only 160 characters, you're not going to be able to sway an undecided voter to vote for your campaign. Similarly, texting is not a good tool for going negative. The alloted space is simply too short to convincingly lay out negative arguments against opposing campaigns. Furthermore, your supporters did not opt in to get Spammed with negative messages coming straight to their phone, so it's not worth alienating them by going negative. It's a great way to disseminate small, time-sensitive tidbits of information to your supporters. For example, before Obama appeared on Letterman, the campaign sent out a text to supporters that evening, alerting them of his appearance. This event was very time-sensitive and rather than sending an email at night that probably wouldn't be read until the next day, the campaign guaranteed a timely notification by sending a text. Also, due to the brevity of the announcement, it would have been a waste of an email that could have been better utilized for a longer fundraising message or issue statement. While texting is certainly on the rise and a powerful strategy, it is not going to replace the persuasive and content-rich media such as direct mail, online, or TV. Texting is becoming the ideal method to communicate short, time-sensitive information to your base, but a campaign has to be very careful not to alienate their base by sending superfluous messages straight to the phones of supporters. While texting has been in use by campaigns for the past several years, it really came into its own in the past cycle, powered by Obama's innovative use of building and leveraging lists of numbers. The technology is continuing to grow in popularity and asserting itself as a medium that permeates every demographic. While not perfect for every campaign need and not poised to unseat other entrenched media, texting has already demonstrated itself as a valuable technique for GOTV efforts, event information, base engagement, and more. We will definitely be working with our clients to implement and enhance their mobile outreach strategies, ranging from building initial lists to leveraging those numbers through the course of the campaign. Does your campaign or firm have plans to embrace mobile? Have you already had success with texting campaigns? Has this article helped you understand the value and strategy associated with mobile technology in political campaigns? We've been using text at my firm for three years. Great catch. My fault in that oversight when I put together this post. I corrected the post w/ an Update. Congrats on being such an early adopter of texting! I think the first person I saw using it was John Edwards with his PAC in 2006, so it sounds like you were right at the forefront of the movement. Thanks again for the comment and correction, hope you enjoyed the post!